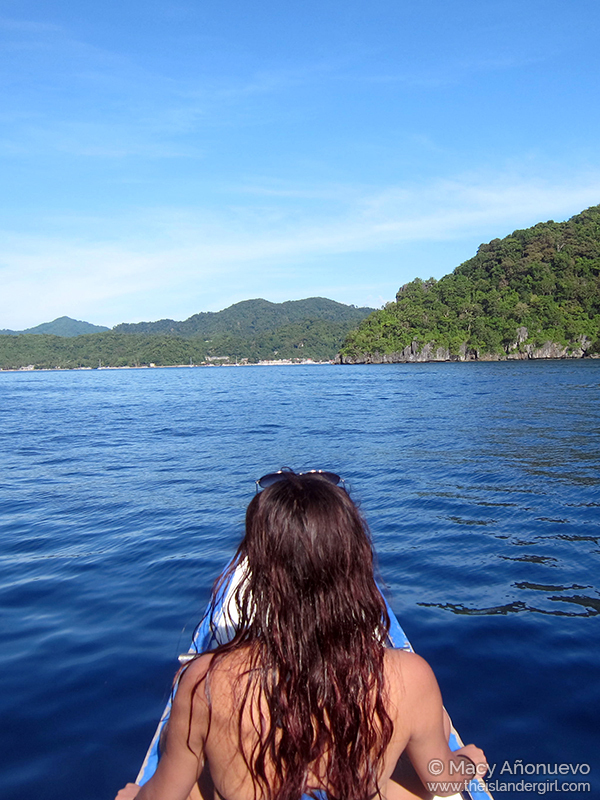 In all honesty, it’s taken this long to write about the El Nido trip because I wasn’t sure what to write. 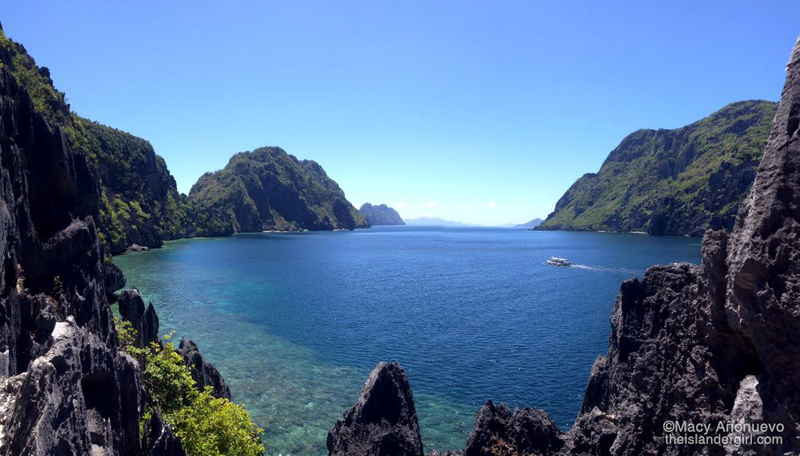 Coming back after practically living there for six years then being MIA since 2015 meant that I watched El Nido change through a screen, with my Facebook feed filled with posts from friends who had grown up there and friends who decided to move there. 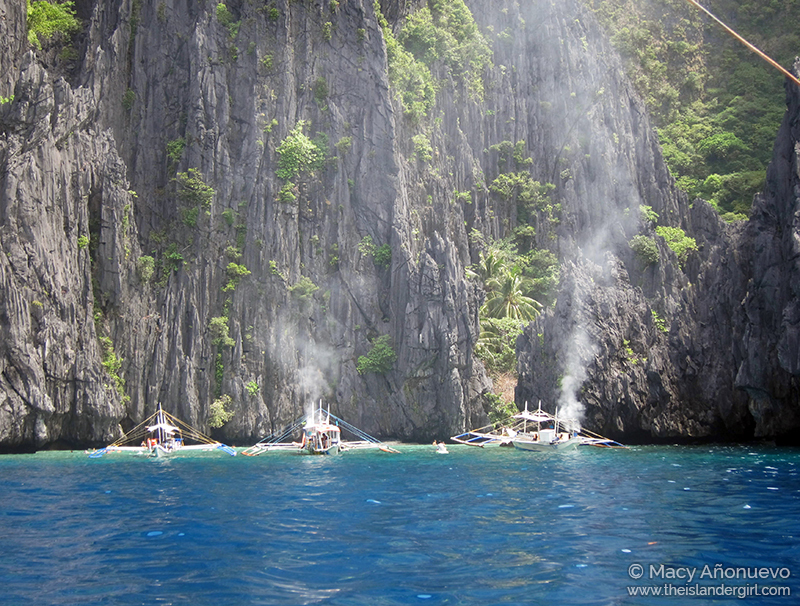 I watched El Nido turn into a crowded tourist destination, with all the good and ilk that comes with it. It was conflicting to see friends proudly start their own businesses alongside seeing the trash and pollution piling up in an unprepared town. I wasn’t sure how I felt then, and I’m not sure how I feel now. Since my friends wanted the quieter El Nido experience, I suggested that we stay in Corong-corong instead of El Nido town proper. It’s only 10 minutes away by tricycle, but miles away in terms of vibes. Corong-corong still feels like a small seaside town, whereas the Poblaciion feels like Boracay (take that however you will). We ended up staying in an Airbnb house to save money. PROS: it was cheap and the rate included breakfast (standard fare of rice, cured meat, and egg) and drinking water. CONS: the sleeping area itself was really cramped so we only went inside when it was time to sleep. There was also no generator, Wi-Fi, and Globe signal. There was a blackout during our stay so all of us just hung out outside in the small lounge area. 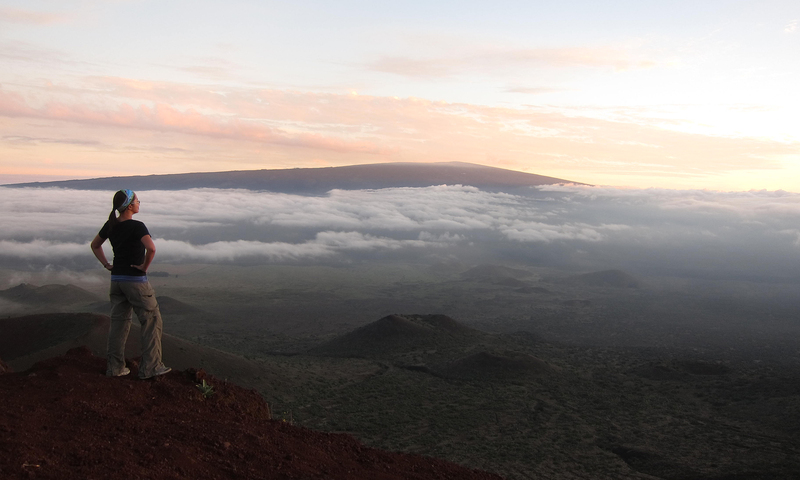 On the upside, we came across the kickass Kame House Backpackers! 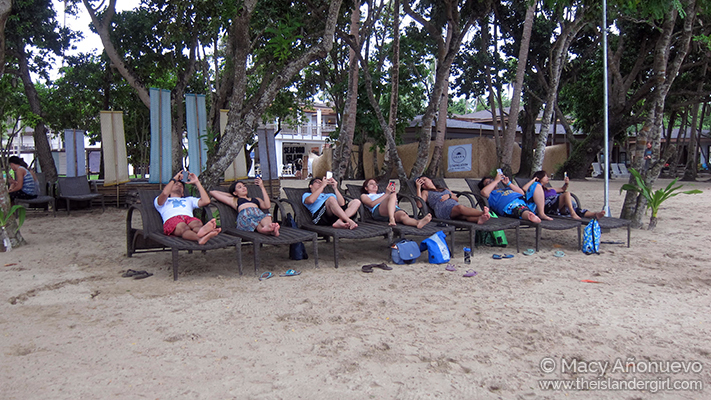 , which my friends are willing to go back to El Nido for. Huzzah for having a generator! No restaurant but they do have a bar, which is cool too. My husband and I were also lucky in that my former boss-turned-ninang gifted us with a two-night stay in Hotel Covo. 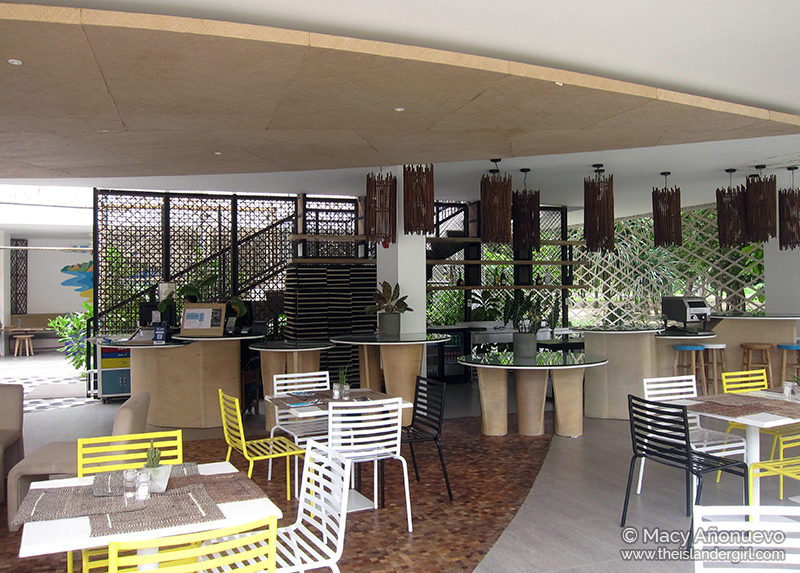 Located in Lio Tourism Estate – about 10-15 minutes from the Poblacion, which makes it about 25 minutes from Corong-corong, Hotel Covo is one of three boutique hotels in Lio run by Ten Knots Development Corporation (TKDC). 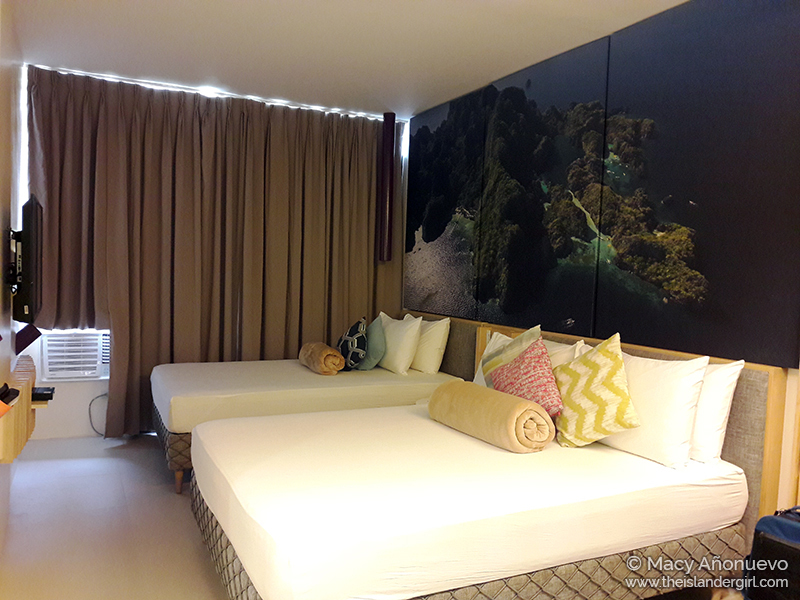 TKDC is the owner and operator of the El Nido Resorts island resorts. 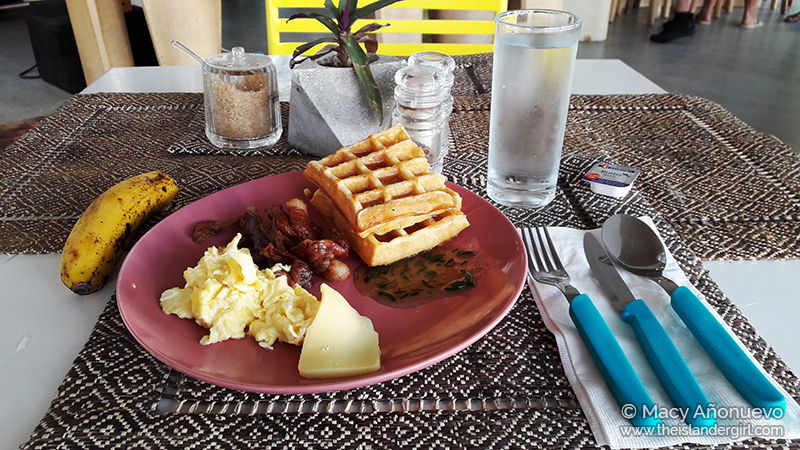 Compared to her sister hotels Casa Kalaw and Balai Adlao, Hotel Covo has a happy, funky feel that attracts barkadas out to have fun. It’s reflected in the bright colors of the decor and the open-air lounge area. I really enjoyed our stay here. Their Deluxe room sleeps three persons (one queen bed and a single bed, which were super comfy), with a satellite TV (didn’t use it), AC, hot and cold shower (YAY), and drinking water (via a shared dispenser on our floor). 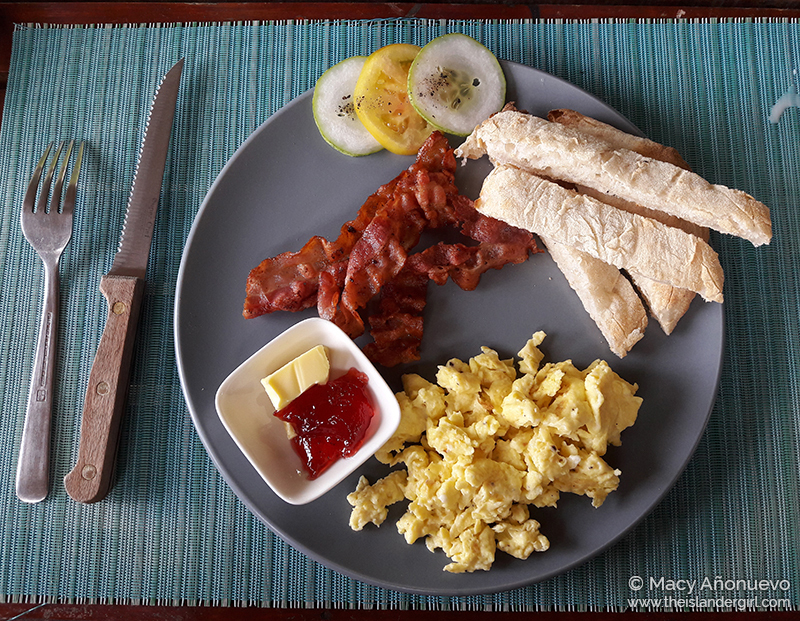 The rate includes a delicious buffet breakfast, so eat up and get some energy for your tours. If we could afford it, we could have stayed here the four nights. I loved Bella Vita‘s breakfast platter. It was reasonably priced (for El Nido) and filling. I loved their baguettes (freshly-baked!). They also serve tasty thin crust pizza. Alas, no photos because we dug in as soon as they set the plates down. We kept coming back, the food was that good. Bella Vita has an excellent view of the sunset so park yourself on one of their beach chairs and enjoy a cold drink. Price range: at least Php 300 per person, depending on whether you order alcohol and other drinks. Pair-A-Dice Burger Bar. I wasn’t feeling so hot at the time so I only ordered their chicken pesto sandwich. It was a decent-sized sandwich and came with lots of fries. I think we could have split the sandwich and ordered an appetizer instead of getting a sandwich each. Tasted pretty good too. Take note that their service can be a bit slow. 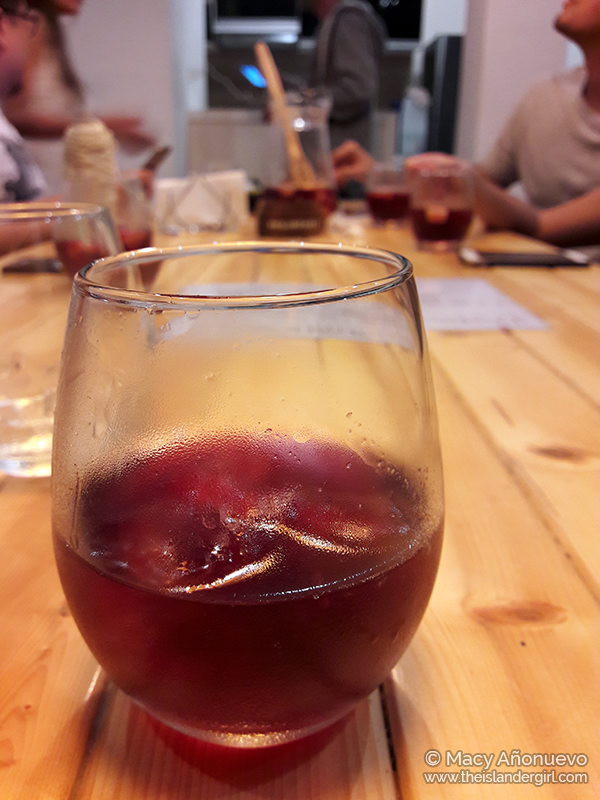 Price range: at least Php 350 per person, depending on whether you order alcohol and other drinks. Fat Choy. I know, Chinese food on the beach is kinda weird but trust me, you won’t regret eating at Fat Choy. Fast service, delicious food, acceptable price. Price range: at least Php 300 per person, but can be less if you’re not a big eater. Globy Restaurant and Bar. Skip it. Food is decent, sure, but unremarkable. Kinda expensive also and the service can be slow. It’s a “global” restaurant ,but the menu feels cobbled together rather than different pieces of a whole. Bead Cafe. 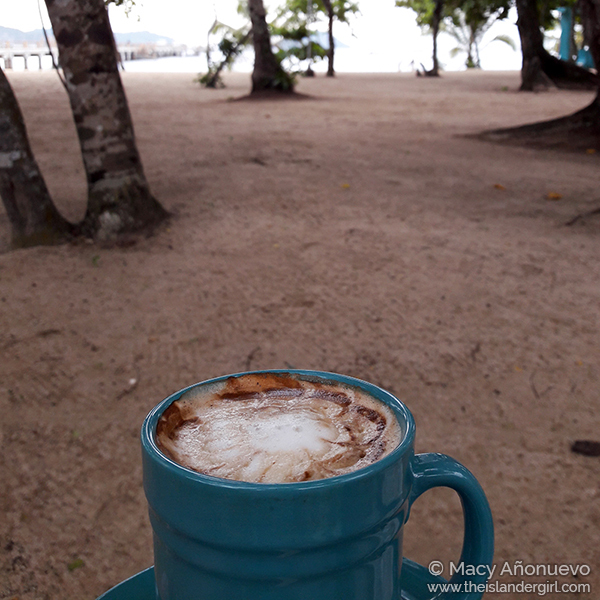 Bead Cafe is the only coffee shop in Lio. They offer bead + coffee combos, where you can make a bracelet or necklace while you’re having coffee. I only got coffee because their crafting options were really expensive and didn’t seem worth it. Their coffee was okay – not super amazing but not bad either. Not many options for pastries too. As the resident “expert” (LOL), I was in charge of planning our itinerary. 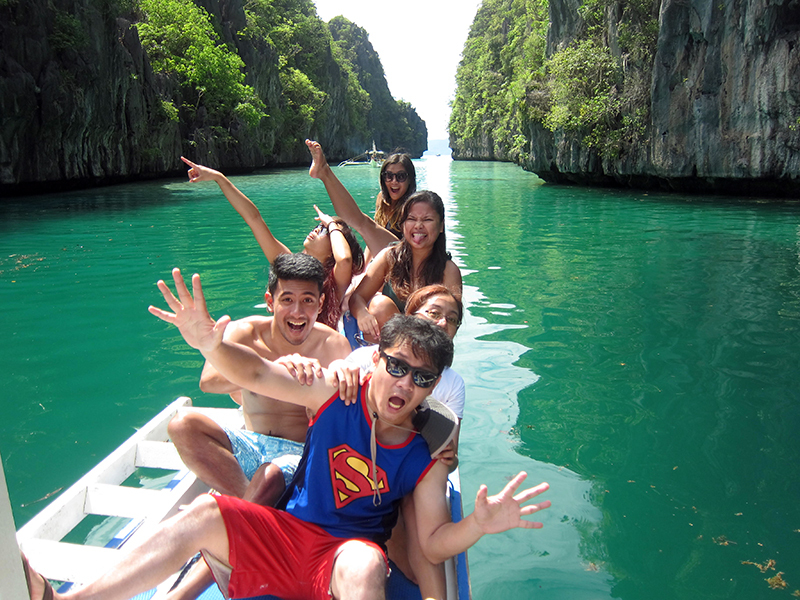 It wasn’t difficult, as we only had a few days and almost everyone in the group was a first-timer to El Nido. This meant that the obvious itinerary was to focus on Bacuit Bay. 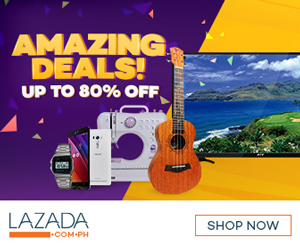 We did all our tours with Leatherback Travel and Cruise (hai Kuya Joie!). There were seven of us, which meant we could afford to charter the banca and control our schedule for the day. 1. Grilled food FTW! Lots of grilled fish, squid, and liempo. Lots of fresh fruit too. 2. The guide was very helpful, especially to my husband who doesn’t know how to swim. 3. The boat crew were pros. 1. They took too long to leave the dock. Really. Since we controlled the schedule, we asked to leave at 8am instead of the standard 9am so that we’d arrive at the islands an hour ahead of everyone else. DIDN’T HAPPEN. Sure, they loaded us onto the boat by 8am, but it took them forever to load the food, grill, and everything else so that it was practically 9am by the time we actually left. On our last day, it took even longer to leave because they surprised us with a birthday cake for one of our friends. Yes, it was a really nice gesture but REALLY. Couldn’t they have planned ahead to get the cake earlier or given it to us at the end of the day? 2. The guide didn’t know how to be a guide, aside from the physical aspects (e.g. helping non-swimmers, safety warnings, etc). No briefings before we left, no nature interpretation spiels. 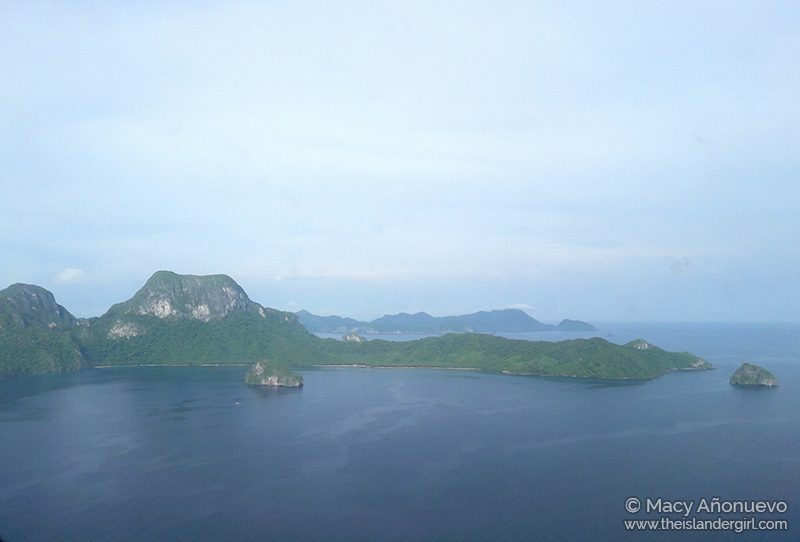 I brought this up with Kuya Joie – a former officemate of mine in El Nido Resorts and the owner of Leatherback – and he said that the El Nido LGU training for tour guides doesn’t include training for nature interpretation. That’s too bad. 3. It wasn’t clear that they were only providing a mask and snorkel, and NO FINS. Argh. If I knew that, then I would have rented fins or brought my own. 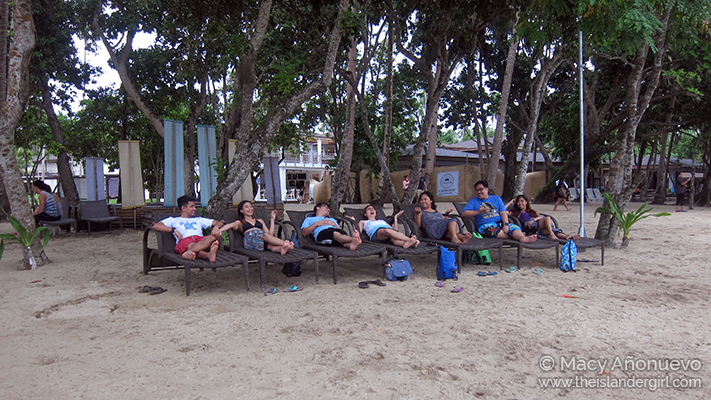 We went on Tour C for the first day, visiting Matinloc Shrine, a snorkeling site in Tapiutan, Talisay Beach (lunch beach! ), Hidden Beach, and Dilumacad Island. Pro tip: if you know the weather is going to turn bad in the next few days (like what happened with us), do Tour C first. Since Tour C takes you to the farthest islands of Bacuit Bay, it’s the first one that gets cancelled in inclement weather. Our first stop was Matinloc Shrine on Matinloc Island. I wanted to do that one first because there’s only one lookout point and if there’s a line when you arrive, you’re going to be waiting awhile. There was a wedding when we arrived, so we waited a few minutes before docking so that the entourage could take some photos on the dock. The view from the Matinloc lookout point is one of my favorites and the sole reason I dragged my friends there. We had an early lunch on Talisay Beach so YAY, we were only the second boat there by the time we arrived. We got a nice spot under a tree and swim some while the boat crew set up lunch. The other boats were just arriving by the time we left. Hidden Beach was also nice, though it wasn’t that Hidden since we still shared it with quite a few people. My second-favorite stop for Tour C was Dilumacad Island. 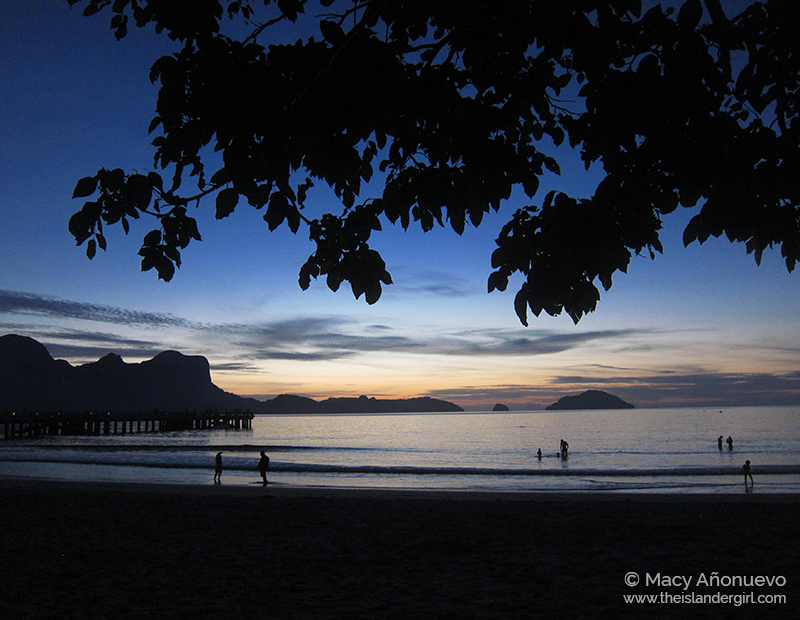 Dillumacad Island is my favorite beach in El Nido: it’s wide and long, and the sand is just as powdery as Boracay’s. Aside from that, the area in front is also a pretty decent snorkeling site (though it wasn’t as good as I remembered it…). I loved that I got to share Dilumacad with my friends. We were supposed to do Tour B on the second day but alas, my friends got hit by food poisoning and the weather was pretty bad, so we decided to stay in and spend the day in Lio instead. My husband and I had to transfer to Hotel Covo anyway, so that made everything much easier. Oh hey, we’re talking to each other! Lio was fun. Quiet and wide beach and free use of the beach chairs, kayaks, and stand-up paddleboards (first come, first served of course). Lio’s beach extends so far out and is so flat that you can swim about 50 meters away from the shoreline and still be in chest-deep water. The water is also flat (usually), which makes it perfect for beginner kayakers and paddleboarders. I took an SUP all the way from the jetty to the Seda hotel (still under construction at the time) and back without wearing surf leggings, so yes to browned legs and feet. My only suggestions for improvement are for Lio to install showers (even outdoor ones!) in public areas and to have towels available for rent. Not sure if they get a lot of day trippers, but it would definitely be nice to wash off the sand and salt before heading for lunch in one of the restaurants. I would even be willing to pay for it, or present a receipt from the shops. 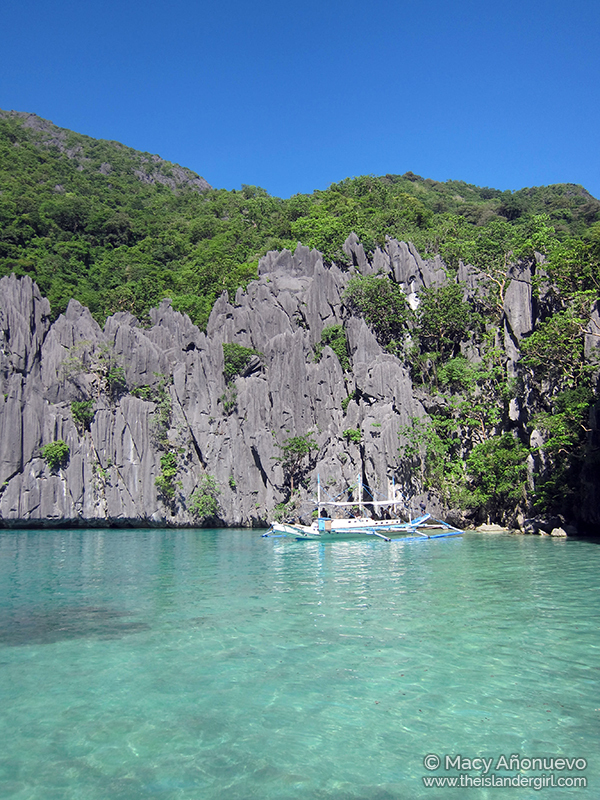 Our last full day was spent on Tour A, visiting the Big and Small Lagoons, Abdeens, Secret Lagoon, Cadlao Lagoon. This is where our disappointment with Leatherback came out in full-force, as they were late and so we left late and so the Small Lagoon was hella crowded by the time we got there. This was exactly what I wanted to avoid, as I already knew that Small Lagoon can only accommodate so many boats before it turns into a pretty war zone. Kayaks are rented out by an association and vendors on kayaks go boat-to-boat selling cold drinks. 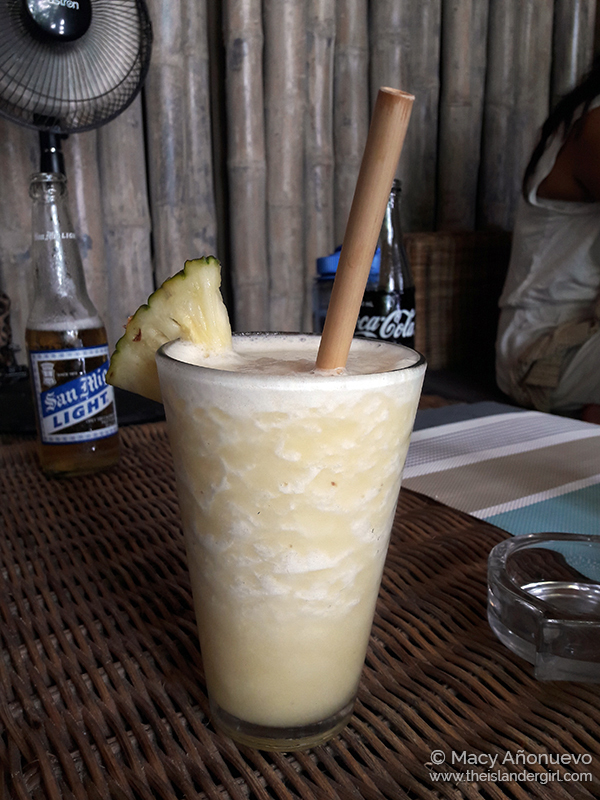 Word of warning: a can of cold soda or beer here costs Php 60 and fresh coconuts are Php 50, so you might want to bring your own drinks. Our friends rented a kayak but I forget if they actually made it inside the Small Lagoon (the inside can only be accessed via kayak). I chose not to because I knew that we’d only be disappointed once we actually made it inside. 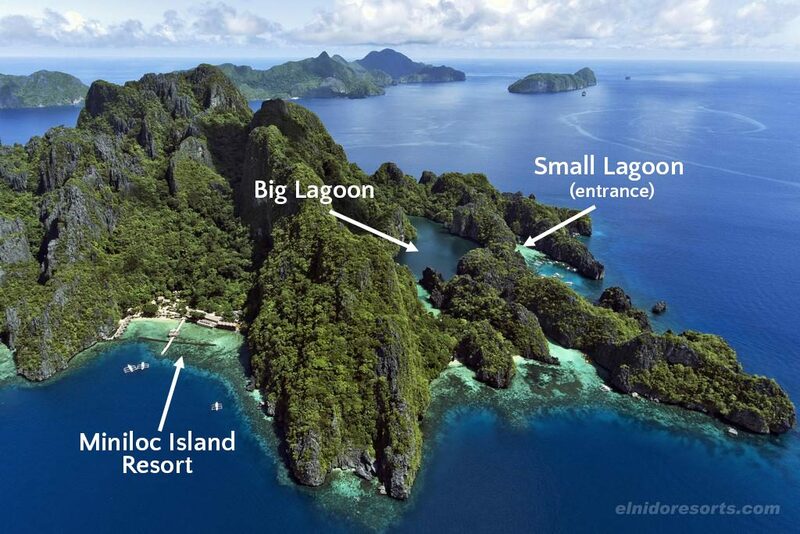 Pro tip: if you can afford it, the best way to get an early start on your Lagoons tour is to stay in Miniloc Island Resort. Big Lagoon around the corner from MIR, which means you can kayak from the resort to the Lagoon in the early morning and have it all to yourself. If you’re feeling even more athletic (though to be honest, I wouldn’t recommend it as it’s really tiring), you could even kayak all the way to the Small Lagoon also. The Big Lagoon was just as magical as ever. It’s just sightseeing here and no stopping, so there were fewer people and boats inside. This is again where I missed ENR’s guides, as the guide from town only pointed out a few “cute” things, like rock formations that look like the Virgin Mary and Batman, but not the environmental aspects like the plants and animals that could be seen in the Lagoon. I really, really hope the LGU improved the tour guide licensing program to include these aspects. Secret Lagoon (also in Miniloc) came after lunch. It’s really an open secret, but I’m glad that there was only one other group when we came in. We visited during low tide, which meant swimming a bit from the boat to the entrance. Warning: wear slippers/aqua shoes/sandals as the rocks underneath are sharp. 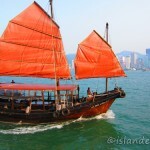 We spent some time just floating inside and savoring the quiet, and left once the other tourists arrived. Abdeens has always been one of my favorite snorkeling spots. There’s a wide reef area at the perfect depth: shallow enough that you can see it from the surface but deep enough that you’re not going to step on the corals. Coral cover is a mix of branching and boulder corals, plus some encrusting corals too. Plus the visibility is typically good enough that you can just maybe make out the cement blocks on the bottom at the boat is tied to. I typically see damselfish here and some butterflyfish and angelfish. 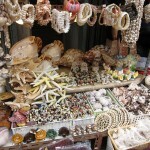 Bonus: Abdeens is also pretty popular with sea turtles! No turtles during our visit though, so sadness. We did get lots of stingers though. OUCH. 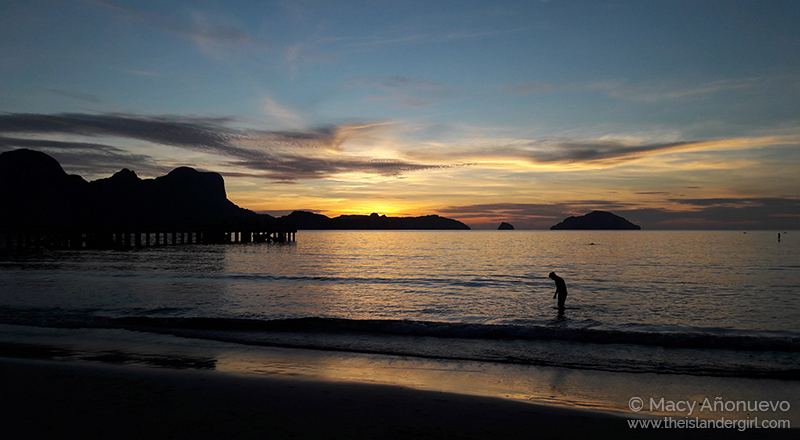 Pro tip: don’t go to El Nido when the water is cold. Cold water means lots of nutrients, and lots of nutrients means lots of baby jellyfish (technically cnidarian larvae) in the water, and lots of larvae means lots of stinging. And I mean a LOT. We couldn’t take it anymore and got out of the water. 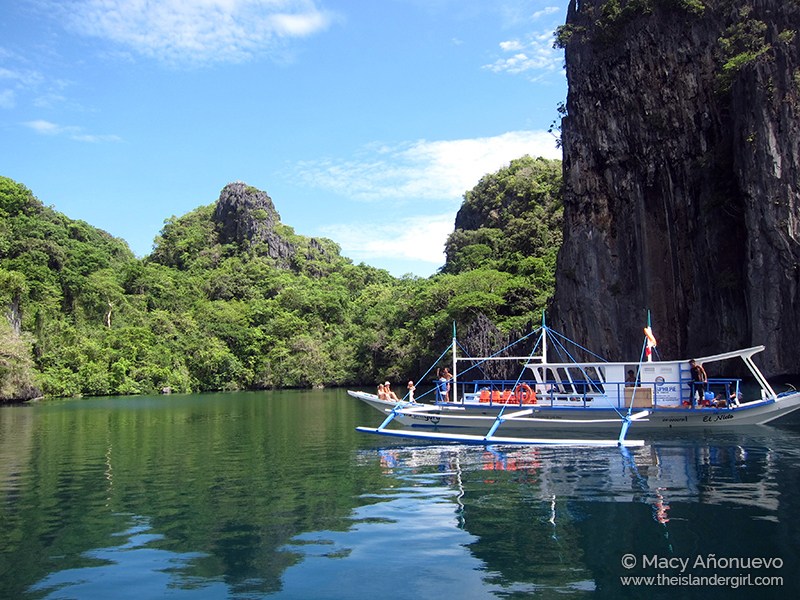 Cadlao Lagoon was the perfect closer to the day. I’d never been there so I didn’t know what to expect. We were only the second of two boats there so YES! Saw a large school of scad (maybe Selar crumenopthalmus ) and another one of rabbitfish (Siganus virgatus). Not a lot of coral, but to be honest, i didn’t really expect that much anyway. 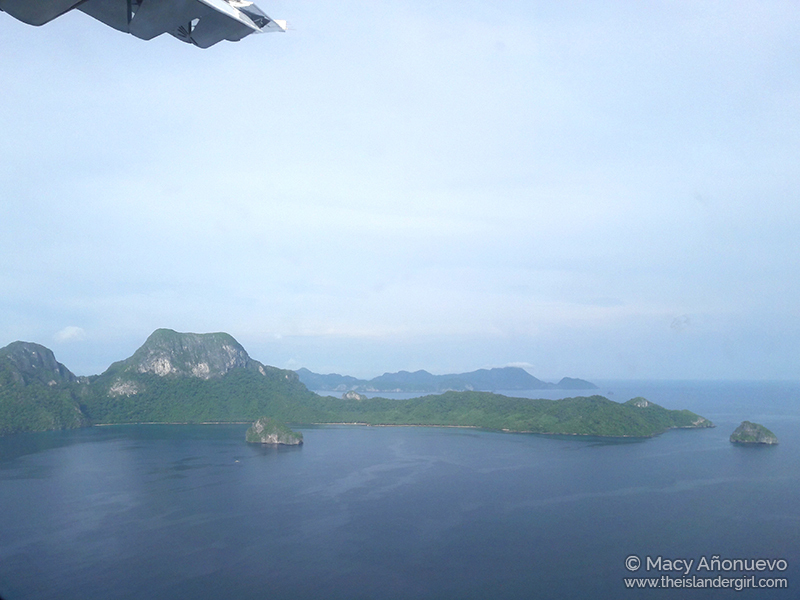 We left El Nido with a heavy heart, knowing that it would probably be at least another year before I could come back. Until then, I’d have to content myself with seeing it through a screen again, watching it change at the hands of the residents and tourists and local government, in the hopes that it will turn out better than what it was during the last time I saw it.